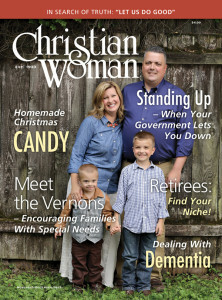 The “A Matter of Taste” column in the November/December issue of Christian Woman features recipes that are both quick (made at least partially in the microwave) and homemade. 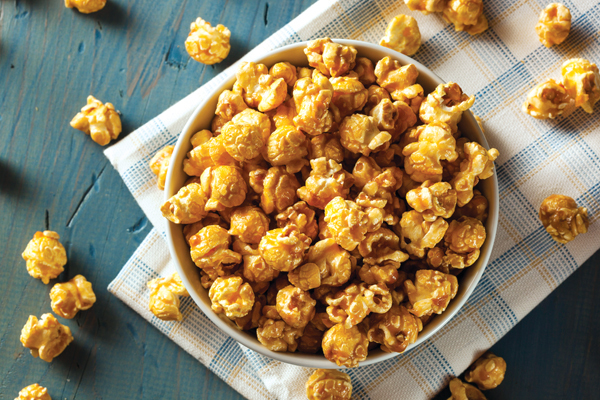 Try our yummy Kettle Corn recipe and let us know what you think. It’s a fun family activity and great to share with friends and neighbors. Call 1-800-251-8446 to subscribe, or click here. Kettle Corn is a sweet-n-salty, coated popcorn that was traditionally made in cast iron kettles. Syrup for caramel corn is cooked to a higher stage giving it the signature caramel color. This recipe is kind of a cross between the two. Place popcorn in a buttered very large shallow roasting pan or rimmed baking sheet. If using double ovens, two smaller roasting pans or rimmed baking sheets can be used. Stir together sugar, butter and corn syrup in a microwave-safe 3-quart glass mixing bowl. Cover tightly with heavy-duty plastic wrap and microwave on high for 3 minutes to wash down any crystals from the sides of the bowl. Remove bowl from microwave using potholders and place on a folded towel or cutting board. Carefully uncover, avoiding the steam as you remove the plastic wrap. Microwave, uncovered, 4 minutes. Meanwhile, preheat oven to 250 degrees. Remove bowl from microwave with potholders. Pour mixture evenly over popcorn; stir well with a lightly greased silicone spatula. Sprinkle with salt; stir well. Do not scrape any crystalized sugar from sides of bowl into mixture. Bake at 250 degrees for 1 hour, stirring quickly every 15 minutes. Spread on parchment paper to cool completely. Break into small pieces as it cools. Store in an airtight container. Yield: 4 quarts.